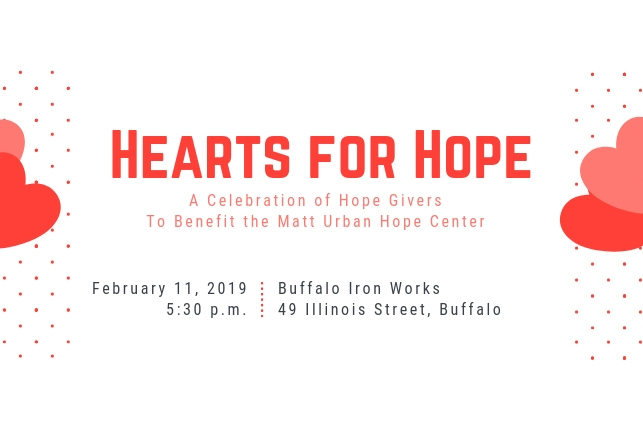 Join the Matt Urban Center for a celebration of Hope Givers in our community! The event will recognize three compassionate local individuals who have contributed to our mission to serve those in need over the past year. The evening will include drinks, food, and live music, with proceeds from ticket sales benefiting the Matt Urban Hope Center and the clients they serve. For more information, please contact Sarah Maurer, Development Coordinator, at smaurer@urbanctr.org or (716) 893-7222 x232.